“Woof” everyone! I think that means hello in the human world. My name is TC, that’s short for Telecommunicator. I want to tell you my story. My people say I’m 2 years old and call me an Anatolian Shepard mix. One day, my 2 sisters and I were left in a park in a place called League City, Tx. The people that picked us up were really nice. 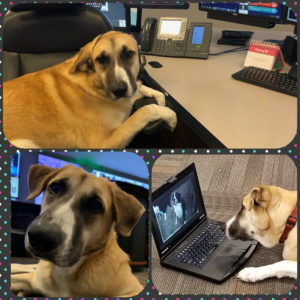 They found homes for my sisters, but I ended up at the coolest place, the League City Police Communications Center! Every day and night, I watch the other TC’s do some amazing thing. They talk on a bone they like to call a phone. They talk to other people on these phones and send them help when they call the communications center. I watch them answer several phones! They have this phone called 9-1-1 that seems to be really important. My fellow TC’s are always so calm with all the callers and professional. Sometimes, I watch them sit at their desks and work on all these big computer screens. The strangest thing I see everyday has to be watching them talk to themselves with this really strange contraption on their heads, I think I heard them call it a head-set? Either way it looks like a funny leash if you ask me. You know what? I have a special job too! See with all the people my TC’s talk to and help, sometimes they become stressed. That is where I come in! I just walk up to my people, did I mention I have 20 people, and I just love on them. I let them pet me, hug me, play with me, take me for walks, and give me lots of treats. I am not sure who needed who, me or them. So you see, they are always busy helping people and I am always helping them. My Human Herd is the Best at what they do. They are Committed to Service and Dedicated to Professionalism. I love being their service dog and would like to show them my appreciation by providing them with lunch. You see I have one problem, I’m a dog, but that’s where you lovely people come in. Could you help me ?